Jason Hartman is joined by Marc Ostrofsky, bestselling author of Get Rich Click!, to talk about making money on the internet with the right knowledge and timing. Marc says domain names and websites are real estate, comparable to buying a piece of land and building on it. He explains how to find good names, how to get started with little to no money through affiliate marketing, outsourcing parts of a business, and using social media sites to make money. He also talks about ways to save money online by taking advantage of technology. Marc explains how reverse e-commerce works, the benefits of crowdsourcing, defines pay-per-action, shares a bit about SEO, and more. Marc Ostrofsky is a professional speaker, consultant, venture capitalist and serial entrepreneur. Known as a “Technology Wildcatter,” he founded the Prepaid Phone Card industry and was an early pioneer in the Voice Mail Industry, Pay Phone Industry, Prepaid Cellular Market and other deregulated telecommunications markets. He created numerous magazines, trade shows and market research studies and later sold those firms for $50 Million+. 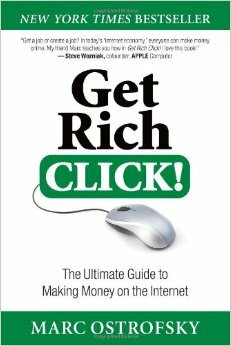 He is one of the few keynote speakers and authors that actually owns a portfolio of highly profitable online business ventures. His current Internet companies generate $75 Million+ annually and include Blinds.com, CuffLinks.com, SummerCamps.com, eTickets.com, MutualFunds.com, Photographer.com, Consulting.com, TechToys.com, BeautyProducts.com, Bachelor.com and others. He has been quoted in over 1000 media outlets including ABC’s 20/20, The Today Show, the New York Times, the Wall Street Journal, USA Today,CNN, FORBES and Inc. Magazine. His firms have won countless business awards including the Inc. 500 and the Ernst & Young “Entrepreneur of the Year” Award. Marc is one of the leading experts on making money online and teaches businesses how to compete effectively in the new digital world. He is known for selling the domain name Business.com for $7.5 million which landed in The Guinness Book of World Records as the most expensive domain name ever sold. He then invested in Business.com which later sold for $345 Million. He is a graduate of the University of Texas at Austin with a bachelor’s degree in Business Administration and a major in Marketing. Marc and his wife live in Houston with their five teenage daughters and two dogs.